Our last project was really interesting but quite tight on budget and time. 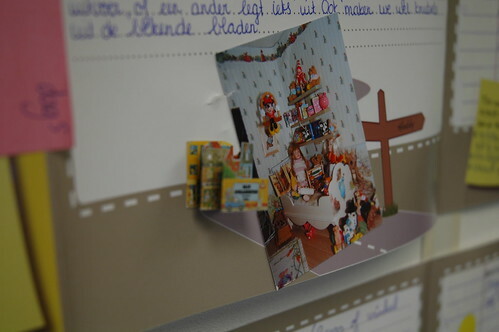 Publisher Scala asked us to find out more about the subscribers of ‘Poppenhuizen & Miniaturen ‘, (Doll’s houses & Miniatures) in a pressure cooker style project. We decided to challenge ourselves; we didn’t have a lot of time but we did want to use qualitative probing methods. We made a diary with 7 themes which we sent to 18 participants all over the country. Time could be saved by not personally bringing the packages (and after some time visiting participants again for analyzing), as we normally do. Instead we made a short instruction video for each day, or theme, which we posted on our website. The URLs were printed on the corresponding page in the diary. 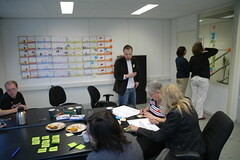 After 2 weeks, we organized a co-creation session for 12 of the 18 participants. The first ‘warming up’ task in this session was taking in and analyzing all the diaries together. This was found quite difficult for most of the participants, although it helped them to see how the others practice their hobby. The rest of the session went pretty well; the participants initialized a lot of new wishes, ideas and concepts for ‘P&M’. 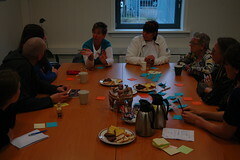 For our own learning we evaluated the project and the methods used after the session. Just sending the probes and links for explanation videos did save us quite some time in the project. Next time, communication about the videos should be better; not many participants watched them. Positive: because the purpose and themes of the diary were quite clear, no extra instructions were needed. Could be better: the URL was not often recognized as ‘help’ and not quite eye-catching on the hardware, colorful page. The persons who did watch the videos described them as instructive and understandable. For this project, the videos saved us some time because we made them ‘quick and dirty’, but making serious, instructive, professional videos can take a lot of time as well. Analyzing the probes together with this group of inexperienced participants probably needs more guidance and strict small tasks than we provided. the researcher can explain the probes and answer questions directly. and of course it is interesting and fun for the researcher to see new people and places! Lovely post Anouk! Thanks for sharing this – especially what worked and what didn’t. Love the videos; did you print stickers to go with the journals? We did sent stickers with the packages, and encouraged the participants to use every other visual they could think of to communicate their thoughts. It also helps promising the participants to return the journals to them after the project; they’ll put even more effort in it.